Cheap labor is one of the strongest factors behind Bangladesh’s remarkable success in the global market for Ready Made Garments (RMG). The South Asian nation, once described as a basket case, is today the second largest exporter of RMG in the world after China. RMG exports (mainly to the EU and US) rake in US$ 27 billion year. And this is made possible, very largely because of the easy availability of cheap female labor. Factory owners get away spending just 12% of their capital on labor. To make the best of the opportunities created by rising world demand and the availability of cheap female labor, entrepreneurs have been flooding the RMG sector since its creation in the early 1980s. The number of units, big and small, registered a quantum jump from 384 in 1983 to 4328 in 2016, and then to almost 5000 now. As per the latest wage structure, announced a few days ago, an entry-level operator will get US$ 95 (Tk 8,000) a month. In the current wage structure it is US$ 68 (Tk 5,300), reports Dhaka Tribune. But the US$ 95 monthly minimum wage is still the lowest in globe, according to a survey report of the Japan External Trade Organization. The survey, conducted between December 2017 and March 2018, reveals that the average monthly wage in Bangladesh was just US$ 101, compared with US$ 135 for Myanmar, U$ 170 for Cambodia, US$ 234 for Vietnam and US$ 518 for China. According to Tariq Adnan (see: www.omicsonline.org) a Bangladeshi has to earn at least US$ 314 per month to house, clothe and feed a family of five. But even the top most Bangladeshi garment factory worker earns only US$ 218 per month, he points out. And if a five-member family is to get the right amount of nutrition and calories, it has to spend US$ 435 on food alone. But as of now, an average worker’s family spends only US$ 168 on food. Adnan’s survey found that 70% of the garment workers complained that they had no savings. However, wages are not the only issue facing the industry. Overall working conditions are appalling. As a result, productivity is low. Productivity fell to US$ 0.22 per hour in 2017, says Tariq Adnan. Poor infrastructure led to horrendous accidents as in 2012 and 2013. And given the callous attitude of managements, the unions and the government, there is no guarantee that such things will not recur. Dilapidated and inadequate infrastructure led to the death of 200 workers at the Tasreen garment factory in 2012, and 1134 died in the Rana Plaza disaster in 2013, in which an eight-floor building collapsed. “According to Bangladeshi law, workers are supposed to work an eight-hour shift. However, garment workers are forced to work extra hours on a daily basis in order to meet production targets set by factory owners. Research shows that around 80% of women workers leave the factory between 8 pm and 10pm after starting work at 8 am, violating Bangladeshi labor laws which state that under no circumstances should daily working hours exceed 10 hours,” Shahab Uddin says. “The worst part is that, after doing overtime, women workers often remain unpaid. Factory owners cut their overtime payment whenever they want. Female workers are cheated more often than men, as they are seen as quieter and less likely to complain. It is also noticed that only a small number of the workers receive letters of appointment, while most of them carry only a factory identity card,” she adds. Most of the factory owners do not follow the 2006 Bangladesh Labor Law, which protects the right to maternity leave. “In 2011, the Prime Minister of Bangladesh announced that maternity leave would be extended to six months, but it remains unclear whether this will be implemented outside the civil service. Factory owners set various types of maternity leave provisions but these were not favorable to women workers,” Shahab Uddin pointed out. “Another inhuman practice which impacts most of the women workers is that many of them are forced to work during the final stages of pregnancy to meet the production targets which seriously hampers the health of both mother and child,” Shahab Uddin notes. “Naturally, these excessive pressures have had an adverse impact on women workers’ health and mental stability. Women workers reported concerns over long periods of separation from their children, particularly women with young children who are being breastfed,” Shahab Uddin says. One of the reasons for the garment workers’ pitiable plight is the fact that the trade unions in the garment sector are weak and too few in number. According to The Daily Star the latest spell of protests against disparity in wages was not guided by union leaders but was spontaneous. In fact, the workers said that they did not want the union leaders to lead because these leaders were hand in glove with the managements. Trade unions are not being formed in the sector though the government had brought down the stipulation for union formation from 30% of the workforce to 20%. Managements have discouraged the formation of unions, though it is universally accepted that unions help bring about settlements and do not always cause unrest. According to www.lawatthemargins.com, unionizing workers in Bangladesh is not an easy task. Trade union organizers say that they get beaten up by the police or the factory hooligans. 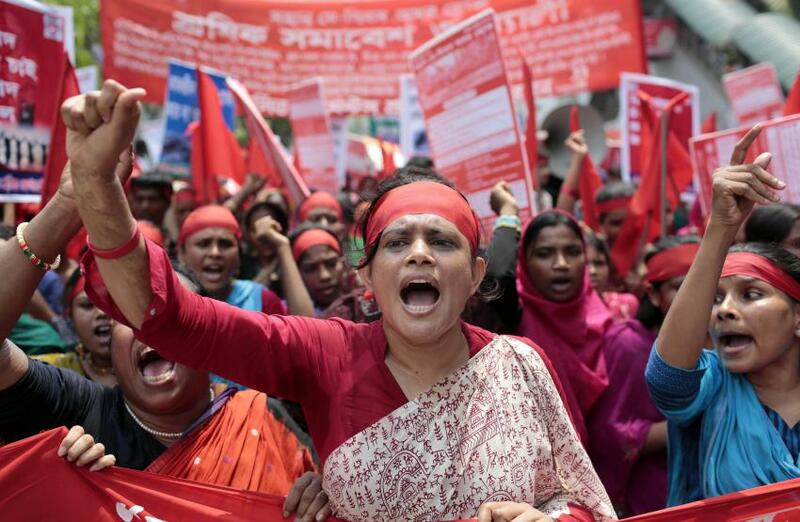 The high profile murder of labor leader Aminul Islam in 2012 (allegedly by the National Security Intelligence Agency of Bangladesh), reveals the severe constraints under which trade unions seek to improve workplace conditions, the website said.